The Dominican Republic is almost south from here, so naturally we'll be sailing east tomorrow to get there (ha ha). The reason for this is that the prevailing winds are from the east, and the current flows from that direction as well, so the idea is to get as gain as much easting as possible before heading south. Doing so in this case means crossing the Turks and Caicos bank from French Cay, which is on the west side of the bank. When my wife Paula and I went cruising back in '98 on Nora, we also took this route. We had just anchored near the small bay at French Cay. The man and wife from the only other boat at anchor, a French catamaran, came kayaking over to greet us. (This was nice, but we hadn't even finished anchoring, which is a little bit of a faux pas.) Nonetheless we offered them white wine (bilge-temperature - it was all we had). 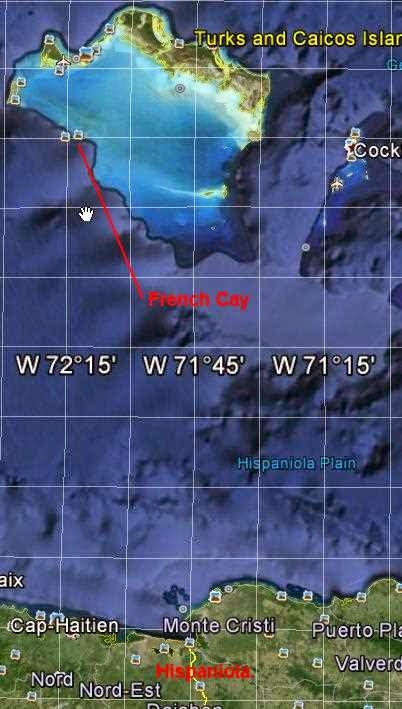 French Cay is also roughly 100 nm north of Haiti. On the way in, we had seen at a distance what we guessed was a Haitian boat sailing north. It was actually quite beautiful with a huge creamy worn mainsail made from this and that, a tiny headsail, and the mast and boom made from not very straight tree parts. We later found out it was a typical Haitian boat in that it was a 40 foot sloop built on the beach with whatever the builders could find. These boats are also internally ballasted with whatever they could find - rocks, scrap metal, etc. (In other words, they're not well-ballasted at all compared to a modern sailboat that has the ballast down in the keel external to the boat). marine police boat heading out to intercept her. We turned the VHF back on to listen. After about ten minutes, the sloop turned back south, and the marine police sped over and hid behind our Cay, which was the land nearest to the sloop. After about 15 minutes, the sloop turned north again. 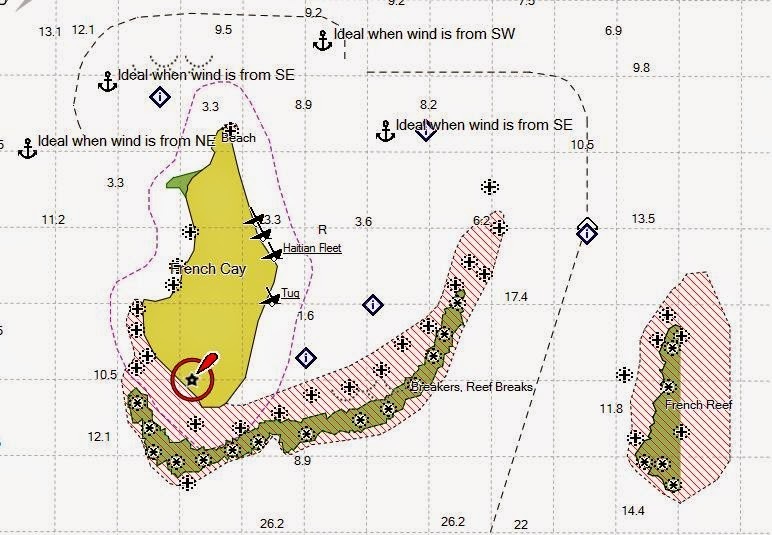 The marine police sped back out, turned them south once again, and went back to hide behind our Cay. We were intrigued by this cat and mouse game, but shortly after the fourth time the two boats met, I noticed the sloop had vanished. Then we heard panicked voices on the VHF. The voices were those of the marine police. The sloop had capsized. The police were pleading for help from headquarters, saying that there many many people in the water and many still in the boat - way too many people for them to rescue. At that point, the man from the catamaran stood up, chest puffed out, and said in a noble baritone and French accent: "I MUST rescue them." He jumped in his kayak and paddled back to his boat as fast as he could, leaving his wife on our boat, who immediately began wailing "Stop him! You must stop him! They'll kill him! They'll kill him! I know they'll kill him!" We just stared at her wondering what she was talking about and what she expected us to do. Eventually she paddled back to her own boat (where a very active discussion ensued). Shortly after this, the marine police boat began making trips to the crescent beach in our little bay. They would unload perhaps 15-18 survivors and then would speed back to the capsized sloop. On the third or fourth trip, they also started laying bodies on the beach. The sloop itself was drifting, and many bodies had drifted away from it, so they couldn't retrieve all of them, but their estimate was that there had been 113 people on board. On a 40' sailboat. They must have been packed tight below and must have been covering the deck. We counted something like 70 people alive on the beach and 18 dead. We were horrified and moved. 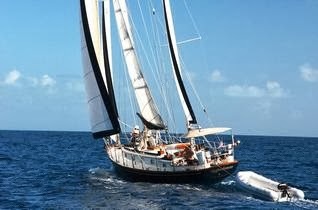 We considered hauling anchor to go to the capsized boat, but they were too far away at our speed for us to be much help. We gave as much water as we could spare to the marine police for the folks on the beach, and we also cooked up as much rice and other stuff as we could put together for them. At this point, I believe the heroism aboard the catamaran was surpassed by fear; they hauled anchor and went to find a different anchorage. (I am not criticizing them for this). We did stay the night, but we did keep an alert night watch. We had no trouble. The next day, a larger Turks & Caicos marine police boat picked up both the survivors and the dead. I still sometimes try to imagine 113 people in a beach-built, internally ballasted 40' sloop with a huge mainsail, and this makes me understand like nothing else just how bad things must have been in Haiti. Wow. I had never heard this story before. It is terrible and frustrating every time I hear stories like this. The people crammed on boats. The people walking through te desert. The ones in the back of trailer trucks. The ones who send their children away to strangers during wartime. No one should have to feel that depserate. On another note, please tell Cash that I tried two different times to comment on his latest blog post. Both times, I got a message saying it would be visible after verification. I guess I'm still under scrutiny?